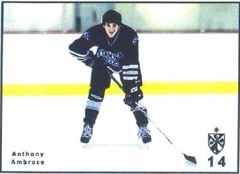 in 2009, the Fenwick Hockey family lost a very special person in Anthony Ambrose. Anthony was always first to support a teammate, crack a joke in the locker room and come to the aid of a friend in need. The Ambrose Scholarship keeps Anthony’s spirit alive by supporting members of the Fenwick Hockey family in need of some assistance. ©2019 Fenwick High School Hockey / SportsEngine. All Rights Reserved.